… And we’re back! 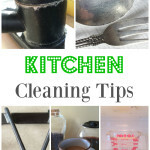 I know it’s been a few weeks since I’ve done a cleaning tip. Sometimes life gets crazy, and finishing up the One Room Challenge was just that… crazy. 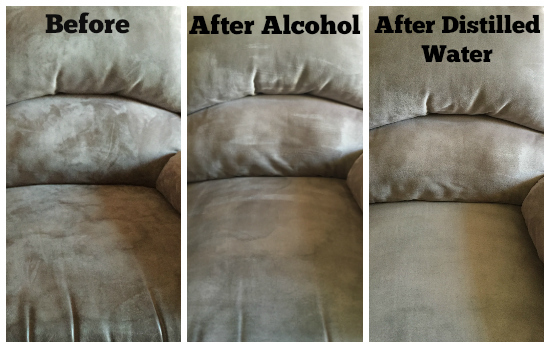 Today, I thought I’d address a question I got from a reader awhile back, and that’s, “How do you clean a microfiber couch?” It does seem that microfiber couches can look stained and worn, and much of that is because water actually stains microfiber; and water is the one innocent beverage we let our kids carry around without worry. The truth is, microfiber is a pretty durable, easy-to-clean, fabric, which is why so many people choose to have it in their homes. 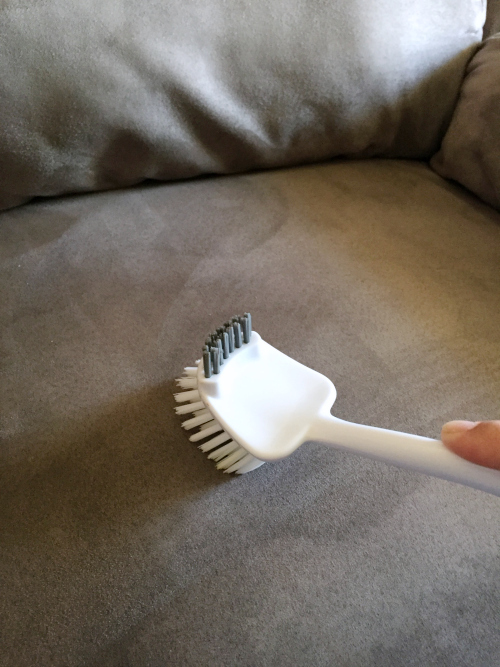 Today I’m going to show you what I’ve always done to clean my microfiber couch, but I’m also going to try something new that I read about in this post from Tada’s Kooky Kitchen. 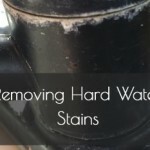 She learned that adding distilled water can help eliminate the water stains, so I thought I’d try it for myself and see what happens. Start by pouring some rubbing alcohol into a spray bottle and spray it on the couch. Don’t be shy; spray on a generous amount. Then, use a clean sponge and start scrubbing. 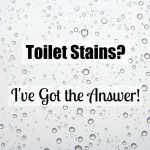 If there are visible stains, scrub hard until they disappear. If needed, you can always spray on a bit more rubbing alcohol. 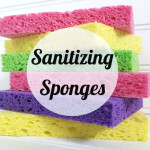 You should be able to see the dirt lifting off onto the sponge. Hint: Working one section at a time seems to be the easier way to go. Luckily, rubbing alcohol dries pretty quickly. Once it is dry, use a soft bristle brush to loosen the fibers. Pour some distilled water into a spray bottle and spray it on the couch. Again, use a clean sponge to work it into the couch until you can no longer see the water stains. 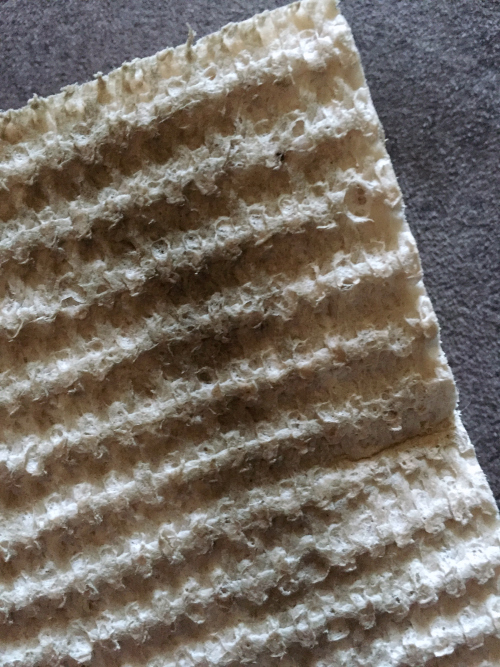 Allow it to dry, and then use the soft bristle brush to loosen the fibers. A definite improvement! I will absolutely be using this method from here on out. In reading your directions to clean microfiber furniture you said to use alcohol. Then talked about distilled water. Are you saying is one or the other or the rubbing alcohol followed by the distilled water. And if it’s alcohol and then distilled water do you wait for the furniture to dry after using the alcohol before using the distilled water? Appreciate your feedback. Fine results. Willing try this one. Thank you for posting. Wonderful tips!! Amazing to see the difference between alcohol and then using distilled water. Not only did the distilled water save my couch and loveseat, but also a pair of boots. I had a pair of faux suede winter boots that sat in a puddle of water leaving horrible water spots on them. The distilled water made them as good as new! Thank you! Can you put essential oil in the distilled water to make it smell better? 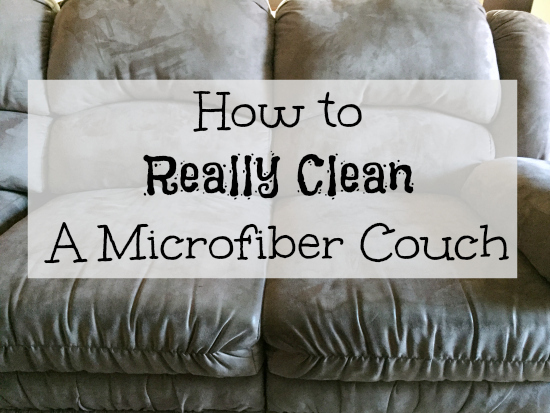 Yep, this is a great way to clean micro fiber couch. Word for word. The couch is cream colored with 3 toddlers. I told my daughter this was not going to work with grandkids. And it’s a miracle cleaning solution. Thanks Grandma M.
can i clean my micro fiber furniture with my rug doctor? How much distilled water? What the ratio of distilled water to alcohol? You are actually using the distilled water and alcohol separately, so there is no ratio. You are simply going to spray on the alcohol, scrub, allow to dry. Then spray on the distilled water, scrub, and dry. It’s very important to check your cleaning instructions to make sure your couch can tolerate both of these liquids, and always remember to test in a small, out-of-sight area first to make sure your fabric is not affected. I’ve found Mr. Clean Eraser to work wonders on microfiber. Hi! Thanks for great tips! I’ve had my lounge suite deep cleaned and scotch guarded but it isn’t a water repellent and therefore still gets dirty pretty easily. I was advised to clean up immediately when anything falls but sometimes life happens and I don’t. If I use this method of cleaning would it forfeit my scotch guard guarantee? As easy as it sounds…. Microfiber is high maintenance especially with toddlers and I wouldn’t advise it for anyone. All the best! Does it not smell horrible from that kind of alcohol? 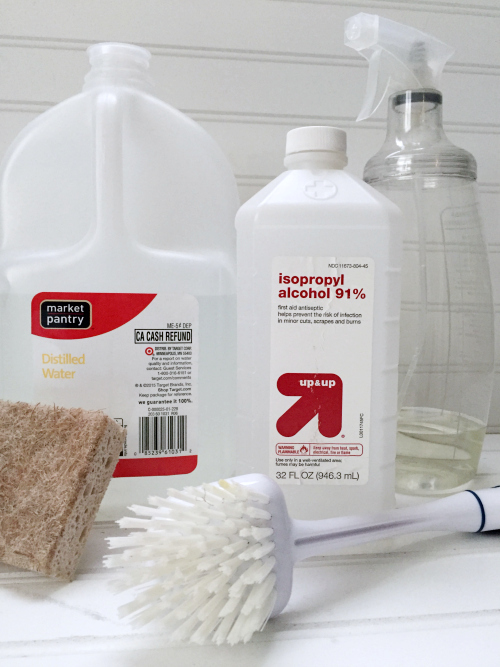 You will definitely smell the rubbing alcohol when cleaning, but the scent quickly dissipates as it dries. Will this method work ? Grease is tough, and typically would require something more than rubbing alcohol and/or distilled water. I would first check with your Stain Guard protection instructions to see if there is information specific to your situation. If not, I might try something like Dawn dish soap, which is great on grease. However, before trying any cleaning method, always test it on a small area that is out of sight. Check to make sure that there is not discoloration, fading, etc. in the fabric before applying to the problem area. I was staying at my daughters helping with my granddaughter because my daughter had had surgery. She had a recliner and chair with an ottoman that my granddaughter thought were her play areas. Granddaughter had ate ate and spilled on the ottamon and had used an ink pin on chair. I had just read this tip and thought it can’t hurt if it didn’t work. It did take some work but it was amazing how great it worked. I started with ottoman since they were getting ready to throw it out. I could not believe my eyes on how great it looked when it dried. The ink on chair all came out. I use the tip on all my furniture st my house now. Also makes the house smell fresher. Thanks for this tip. This did not work for us, at all! However, the scrub brush I used has a white pumice stone on the back. The pumice stone not only took off the dirt but also the water stains! The scrubber afterwards gets it all done. I’m pretty sure it is working because it is literally lifting off the stained fibers but I’m ok with that, our couch was close to death and now looks brand new! I can’t wait to try this tomorrow, I’ll take pictures. Is it okay to use regular bottled water? The reason I would recommend distilled water is because there are no other minerals in it that could discolor your fabric or leave behind residue. So, to answer your question, I would stick with distilled, not bottled. I have a 4 year old microfiber sofa that needs to have the arms cleaned. 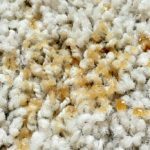 Will the vinegar and distilled water method work on oils from a dog’s fur? The sofa color is eggplant. So would I still use white sponges to clean it? Thanks! I’m a little more concerned about the color of the couch being eggplant. Because this process calls for using rubbing alcohol (not vinegar), I fear the color might fade and come off. 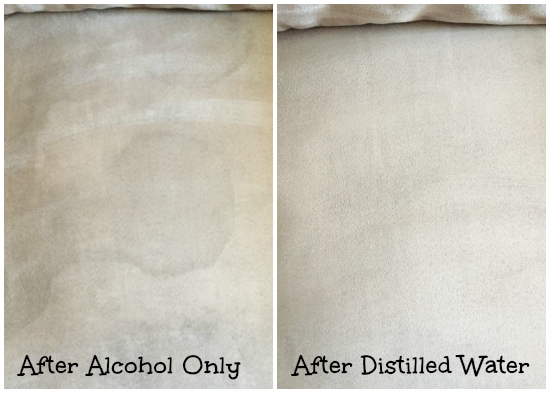 I know alcohol works brilliantly at removing discoloration from dyes on counter tops, table tops, etc. I wouldn’t want that to happen to your couch. If you really want to try it, you could test the method on a small (unseen) area of the couch to make sure no color change occurs. Otherwise, you could try just using the distilled water and see if that works. Hope that helps. This worked so well!! Thank you! The alcohol lifted dirt and grime but I didn’t see much of an improvement until I used the distilled water, and now it’s like a different couch! I’m so glad I didn’t stop with just reading pins that said use alcohol as it wouldn’t have been enough. I KNOW! I used to just use alcohol and was never pleased with the results. Adding that distilled water does the trick. So happy to hear this worked so well for you! I have the same microfiber sofa & loveseat as shown. But the bottom cushions have zip off covers. I always throw them in the washer with regular detergent (ALL or Tide). Set on perma press with very warm water. Let air dry and voila! The only problem is the back and arms. I will definitely do the vinegar and water on that. Thank you ! I am giving this microfiber cleaning a try tonight! I am in disbelief at how well this works!!! Thank you so much!! 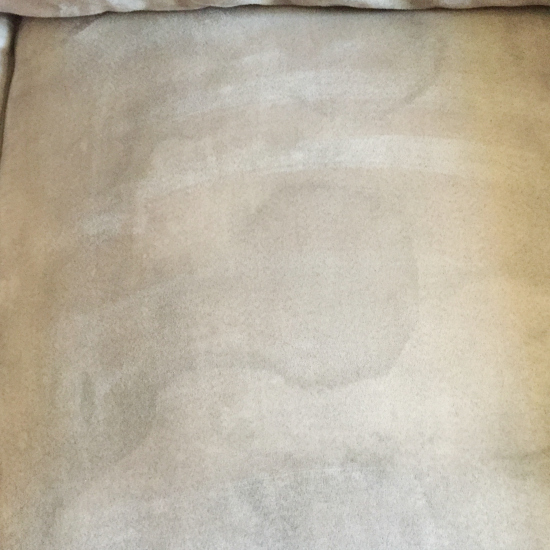 We just bought a “gently used” couch that had quite a few more stains than we were expecting (read: entirely covered in stains and water marks). We were disappointed beacuse we spent $300 on it, but after a couple hours of work, it looks fantastic! The distilled water really changes everything. Thank you times a million. YAY!!! I am so glad this worked so well for you! Thanks for sharing your experience. If you have a microfiber couch, this may work. As mentioned above, some microfiber is meant to be cleaned with only alcohol, and some with only water. You could check the manufacturer’s manual to see what they recommend. If you no longer have the manual, then you could try this method on a small area of your couch first (in a place no one really sees, like the back against the wall). This will gauge whether the fabric is negatively affected in any way. Good luck! My grandson got sick this weekend and threw up all over my couch. Gross. Will the alcohol take away the nasty smell that keeps lingering after I have cleaned with dish detergent? Good luck! Hope your grandson feels better. All I can say is that I hate microfiber and would love to take my set outside and give it a cleasing by fire. It is the apolstery of the underworld and needs to be banished to the psame realm as the polyester pants from the 70”s. Still, I will most likely try this on the couch of the dammed to see if I can get some redemption out of it. Your comment cracks me up! Our microfiber couch is SO old, but it’s great to have with small children as it’s pretty durable and cleans up well. I agree. My puppy destroyed an almost new couch and loveseat. I replaced them with microfiber-the latest craze. My grown dog twice squeezed pillows out his dog door and into the backyard. There’s not one puncture mark present. The surface dirt cleaned up with little effort. With this information, I can keep my furniture for another 13 years. bahahahahaha! Thanks for the laugh this morning!